Faith - Hope - Love for the cause you care about most. 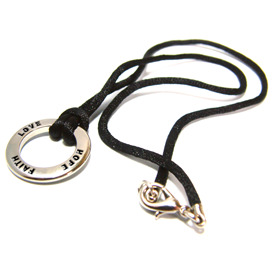 This Faith Hope Love Inspiration Necklace has a 17" Nylon Necklace with a 7/8" Faith, Hope, Love silver color charm ring engraved on both sides. Also includes a silver lobster claw clasp. I Love This Necklace. I Received It Very Quickly. It Is A Very Good Quality Necklace, I Would By From Here Again.